So since i got back from falmouth, i have wanted to get back into the swing of being creative. So as soon as i got back i wanted to turn my room into a studio. So i cleared everything out, threw alot of rubbish out and started a fresh so here is my new work space. My family home is pretty small there are 6/7 of us living in 3 rooms so any space i can call my own is really a luxury so i am really proud and grateful to have a little creative bubble to work in. Previous Post A few days in falmouth. Oh Ella, it's simply wonderful! I love how you've decorated it. I love the things in the little shelf, is it a draw divider?! It looks fantastic 😀 I have a work space in my room, which basically ends up being my whole room bed included cause I insist on getting EVERYTHING out at once. Then I have a little studio in the garage too for any air brushing, sculpting, casting etc. Though it's cold in there so I don't use it as much this time of year. 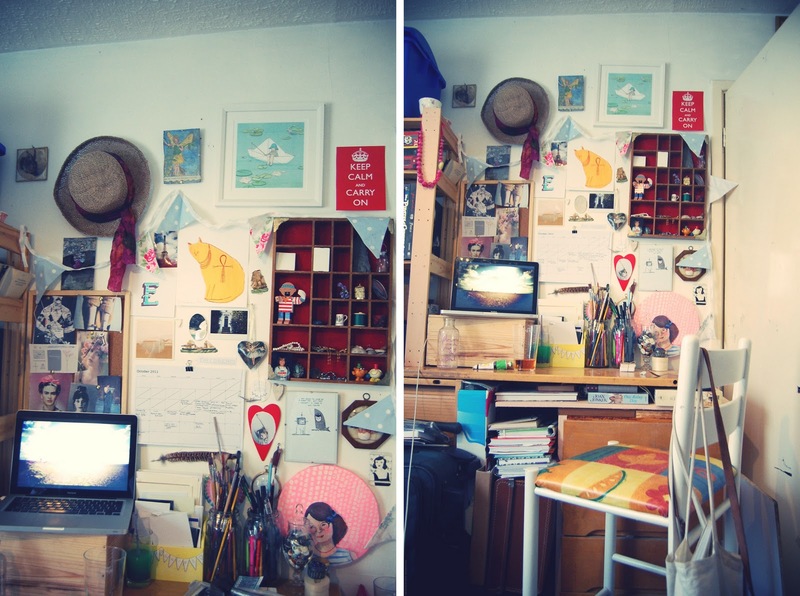 I've been meaning to have a big tidy up of my room and this post has inspired me to get to it. My walls are also all covered in inspiration pictures. oh i would feel so inspired here! it looks great. i love the cabinet on the wall and the hat in the corner. you've done a great job! This is a wonderful space. I bought my little cousin the greetings card belle and boo one with that illustration on and put it a frame. It looked great and at a fraction of the price 🙂 I also have that Keep calm carry on postcard in my room. You have excellent taste me dear. This has inspired me to start again in my room. I have a problem throwing things away, but I don't even know what half the things in it are! I feel like an inspiring area would help me be more creative. 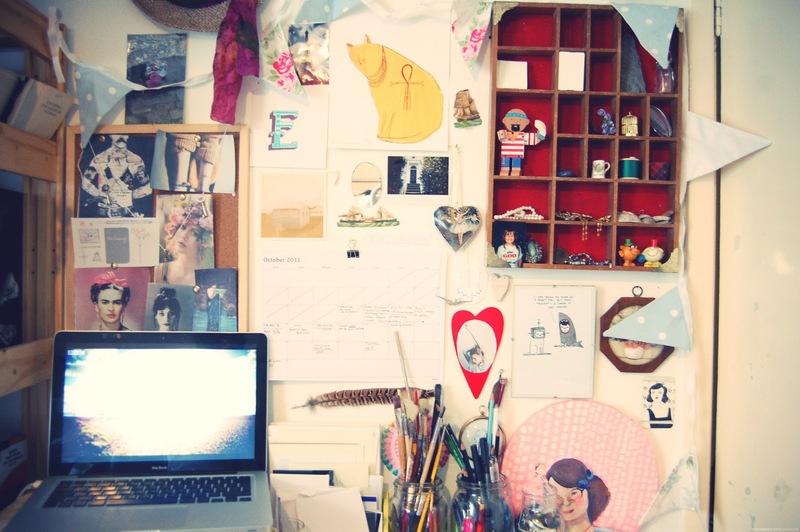 And on a side note, I love looking at other peoples creative spaces too, I especially love tiny versions (I have a tiny room) and workspaces inside cupboards!